Herno: The outerwear brand you need to know about! 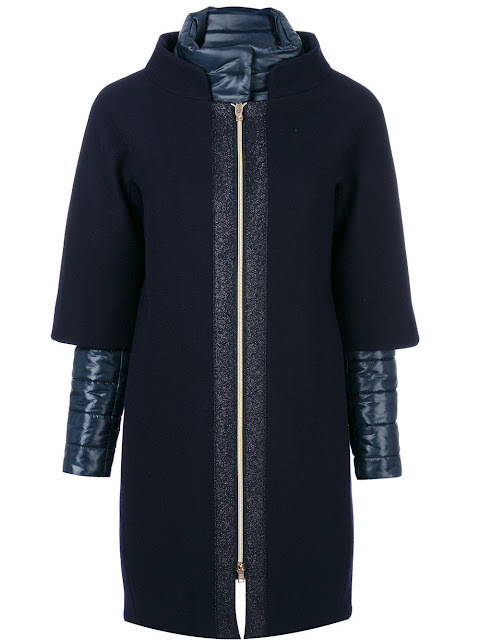 Hands up if you share my obsession with coats? 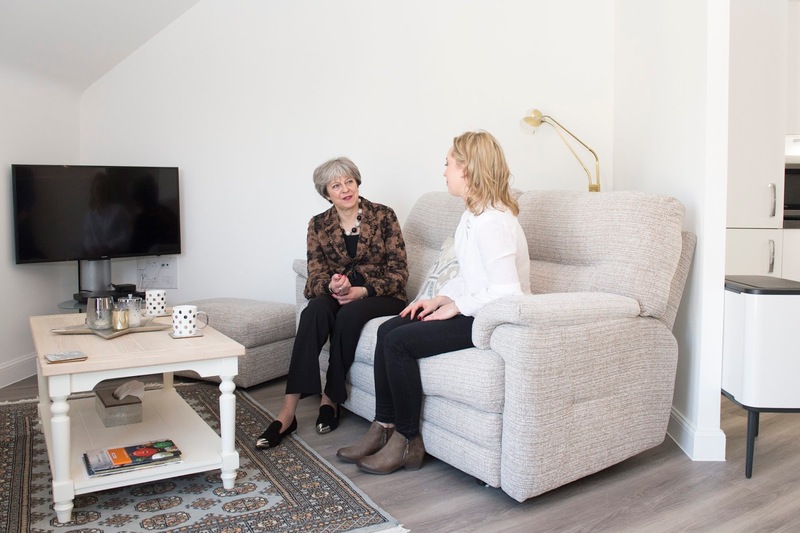 Seems like Theresa May and I are on the same page! 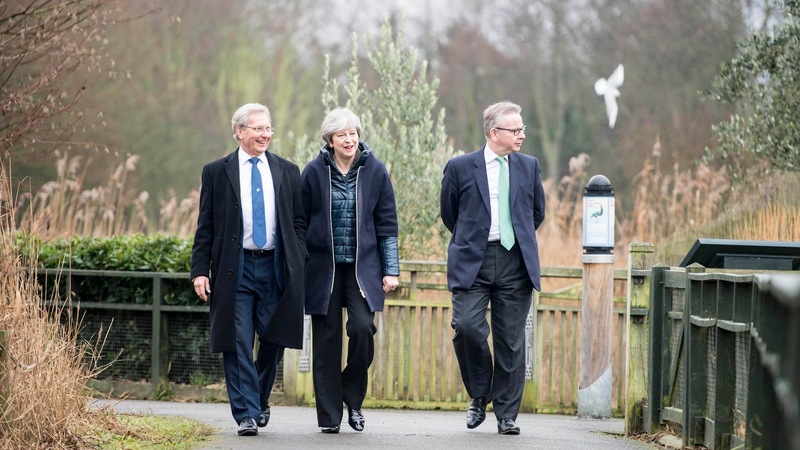 The Prime Minister knows that a good coat can take you for miles, and in this instance, Theresa May has picked a winner! Herno is an Italian brand, firmly focused on athleisure and outerwear with a twist. Founder of Herno, Giusppe Marenzi, set out in 1948 to design the perfect men’s raincoat combining practical functionality and cutting edge fashion. Herno expanded its range of outerwear over the next few decades with both men’s and women’s clothing, reaching across Europe and eventually approaching the Japanese market in the 1970’s and the US in the 1980’s. 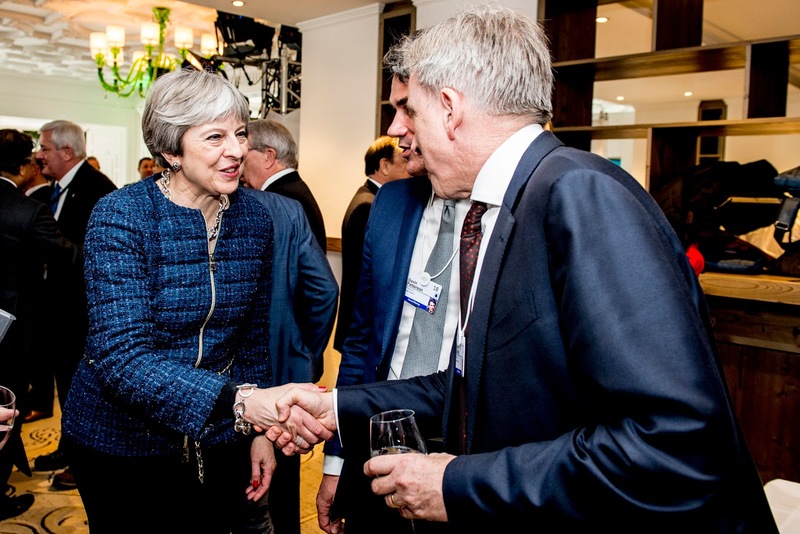 I must admit I hadn't heard of the company until I saw May wearing one of their snuggly jackets last year. 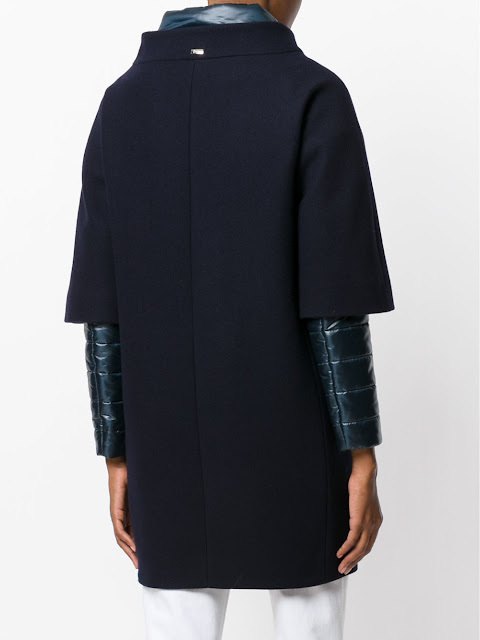 Always in the market for a new coat, Herno is fast becoming my new favourite outerwear brand. Living in the unpredictable British climate, it's pretty hard to be prepared with a jacket that can keep you warm in the wind and rain, but similarly, not cook you when it gets a bit humid. Herno's great range of quilted jackets, puffers and trenches do all three. 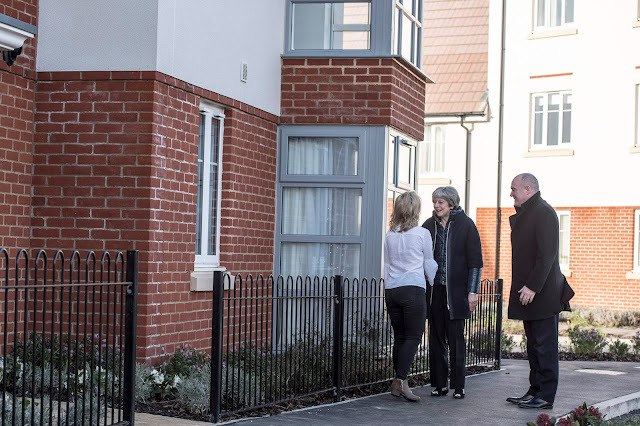 Theresa May has four Herno numbers in her wardrobe. The first is the original black quilted shell that introduced me to the brand. With cropped sleeves and an oversize collar, this coat is perfect for layering fans who want comfort without feeling overstuffed. 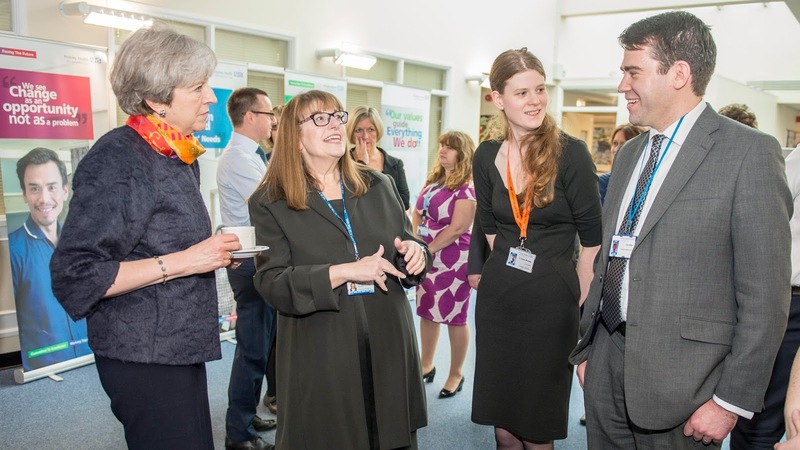 May wore hers frequently throughout 2017, teaming it with practical trousers and not afraid to wear it with a tailored dress to church. 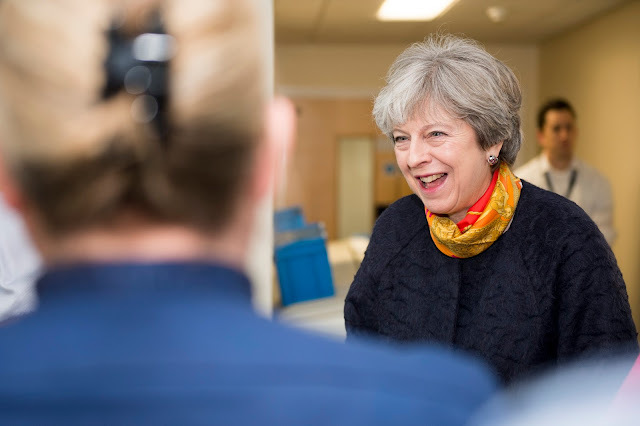 Whilst not an exact match, I'm pretty sure that May's navy rain coat is also from the Herno brand. The distinctive silver rectangle tag on each of the reverse of the jackets is a good sign! 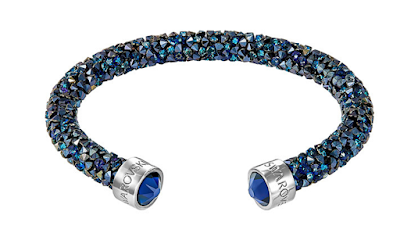 We also love the light blue spotty cuff detailing on this essential piece. 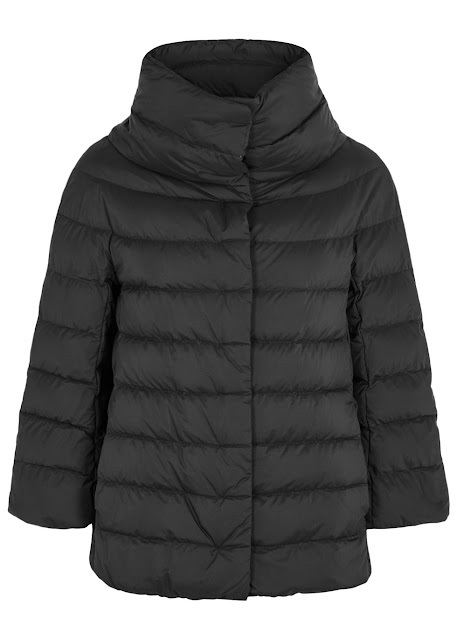 May's third Herno purchase, and quite possibly my absolute favourite is the navy layered puffer. Odds are that this was a Christmas treat for the PM and she has been wearing it religiously ever since! The cotton blend and wool blend layered puffer jacket is a beautiful dark navy shade, with the surrounding zip detail featuring a glittery sheen. 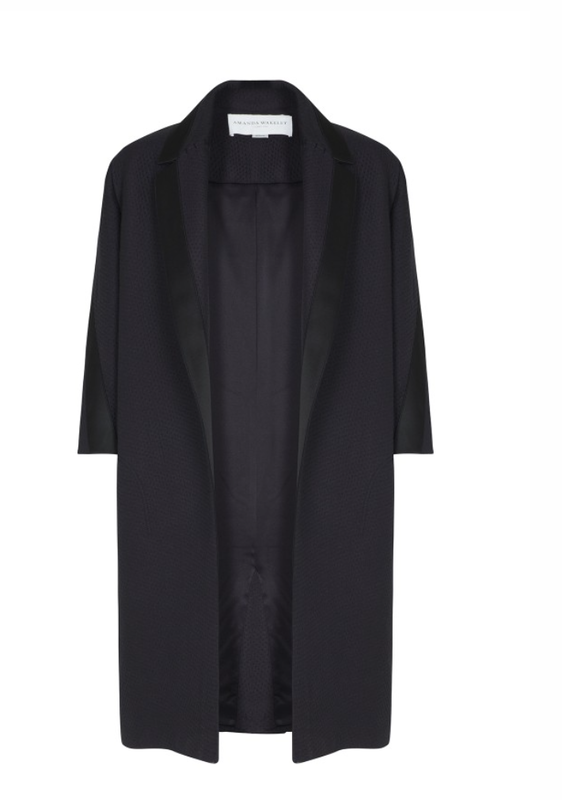 What's so cool about this jacket is that you can zip out the sleeves and front section, leaving you with a shorter length sleeve and the wool coat if desired. Herno makes this coat in both a black and cream number, and I've also seen it without a glittery zip (but who wouldn't want some extra sparkle?!) 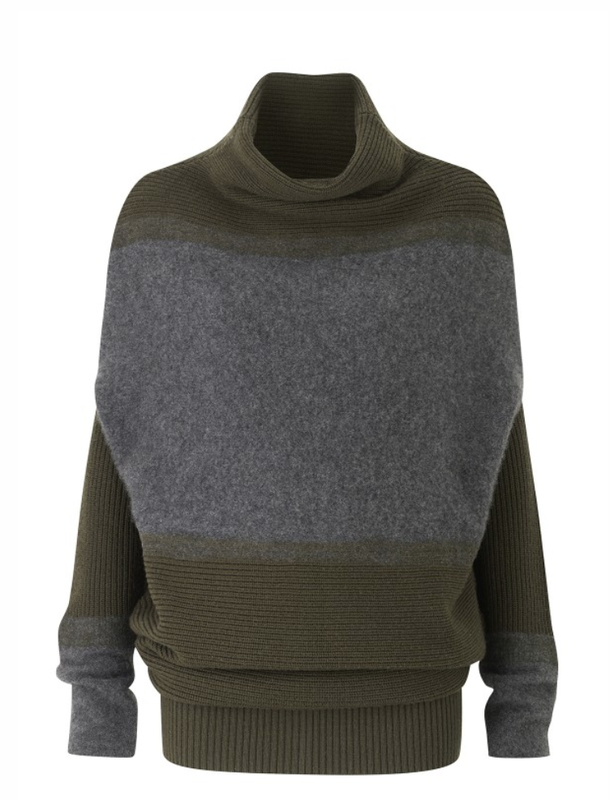 I can see why it's the PM's new favourite and a perfect staple for the colder months. 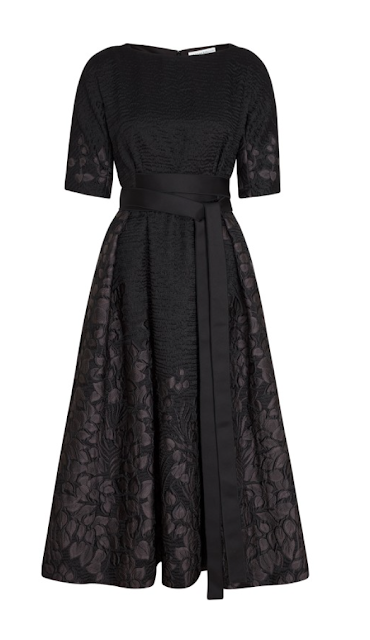 And the PM surprised us all on her trip to the World Economic Forum with a piece from Herno's current collection. 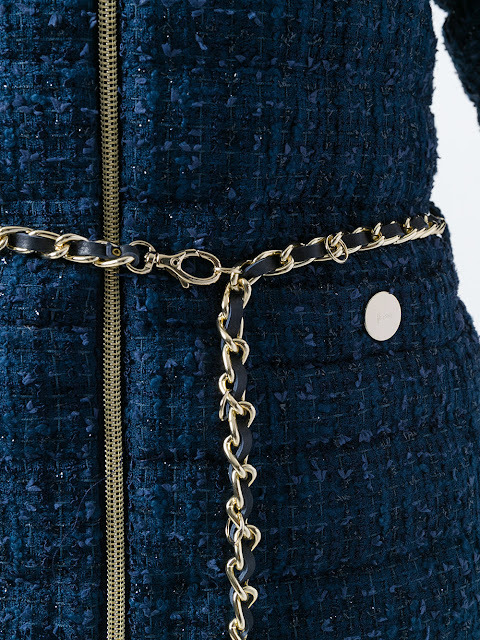 Debuting the chain belt tweed jacket in a chic navy, this too has a sparkly fabric to add some shimmer to the day time. 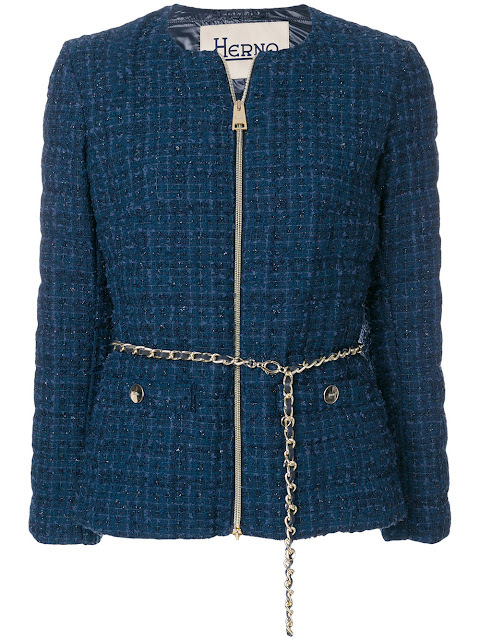 Perfect for the cold climate of Davos as well as our fine British shores, this is a chic take on the Chanel-esque trend of tweed and chains. May paired her jacket with flared black trousers and her signature item- the leopard flat. As a Brit that wears a jacket or coat for the majority of the year, an outerwear piece from Herno is a great investment. For my fellow Brits, Herno is stocked in Harvey Nichols and Harrods, but sites like Matches and Farfetch have an extensive collection of styles that you can shop to your heart's desire. We all deserve a little luxury outerwear- and Herno certainly delivers! 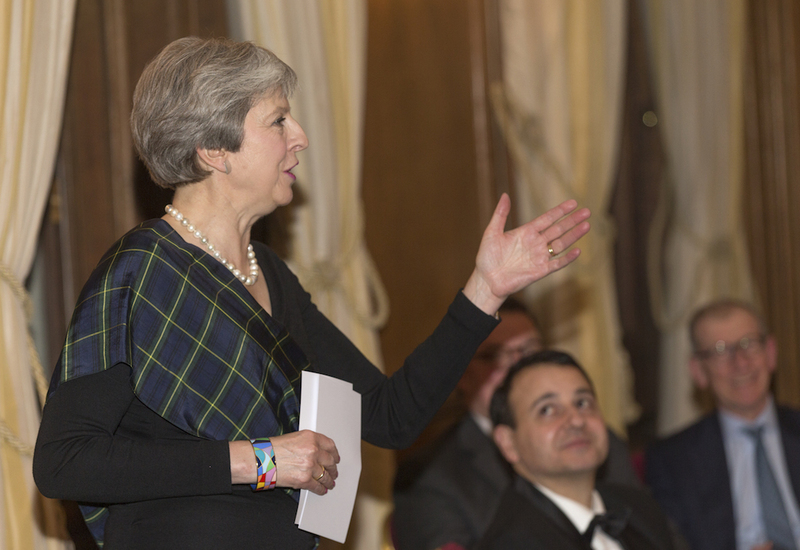 From marking Burns Night to the snowy slopes of Davos, here's a recap of Theresa May's week. 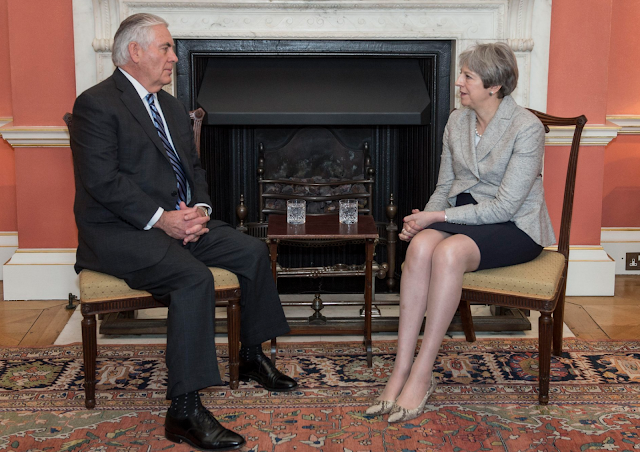 On Monday, the PM welcomed US Secretary of State Rex Tillerson to Number 10. Arriving in her navy Daniel Blake jacket, navy skirt and leopard Charlotte Olympia kitten heels, May changed into her oatmeal Daniel Blake jacket and the snakeskin kitten heels from Russell & Bromley for her meeting. Later that evening, the Prime Minister hosted a Burns Night supper at Number 10 and rocked the Gordon Clan Modern tartan in the process! On Wednesday, May took part in the weekly Prime Minister's Questions. We were in the gallery this time! 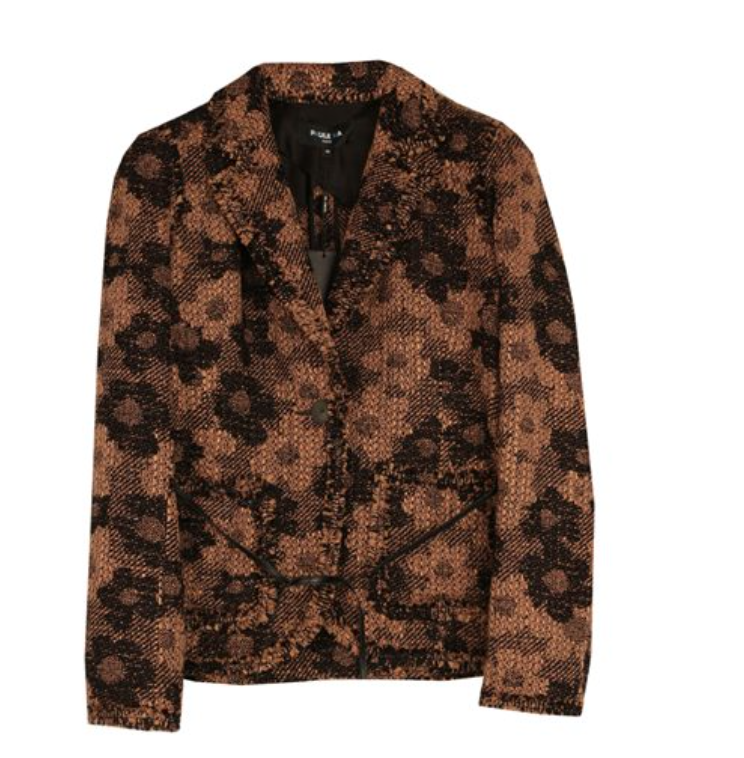 :) The PM wore a brown floral tweed jacket from Paule Ka, black trousers and the Divine flats from Russell & Bromley. The PM carried her trusty Vere satchel from Anya Hindmarch and kept warm in the great navy Herno coat. Later in the day the PM travelled to Davos ahead of the World Economic Forum, swapping her flats for some very practical snow boots from Canadian brand Sorel. 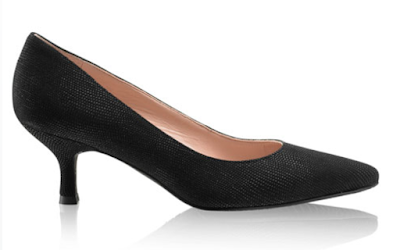 Thanks to Mail Online for featuring our thoughts on this shoe switch! 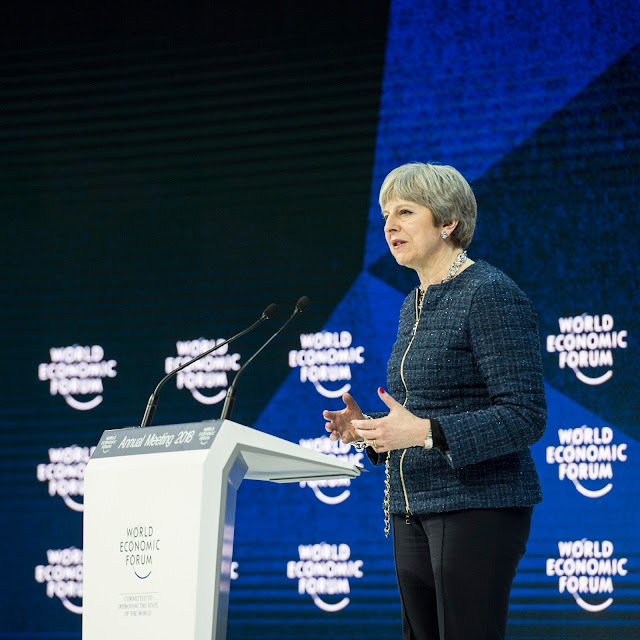 On Thursday, the PM addressed WEC delegates on the power of technology and British innovation. 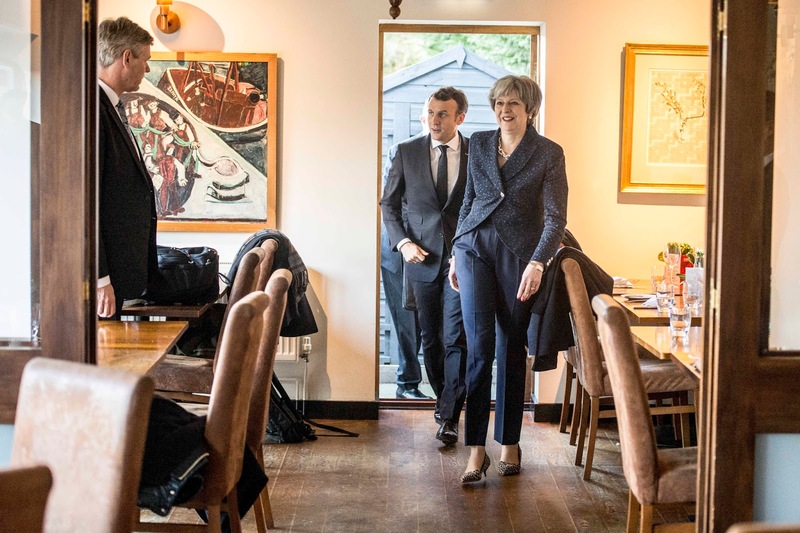 May debuted a new navy Herno jacket with chain detail, teaming it with black trousers and the leopard Delicious flats from Russell & Bromley. Later in the day, May met with President Trump. 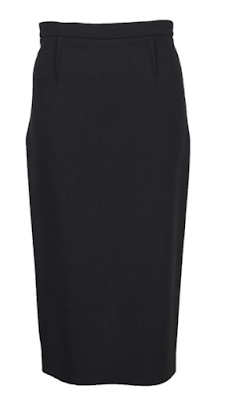 It may be cold and rainy out, but the new season arrivals at Amanda Wakeley are a bright ray of sunshine! With a focus on striking transitional pieces, there are so many great items that have just arrived. 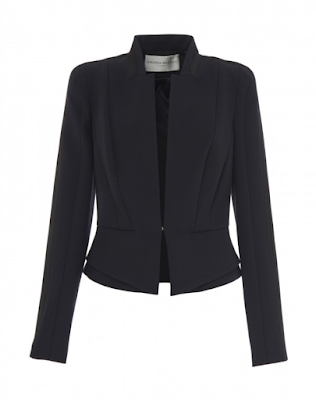 With an eye for sharp tailoring, I am falling in love with many of the jackets and luxe coats that Wakeley has designed this season. It's all about making a statement in a luxurious way! 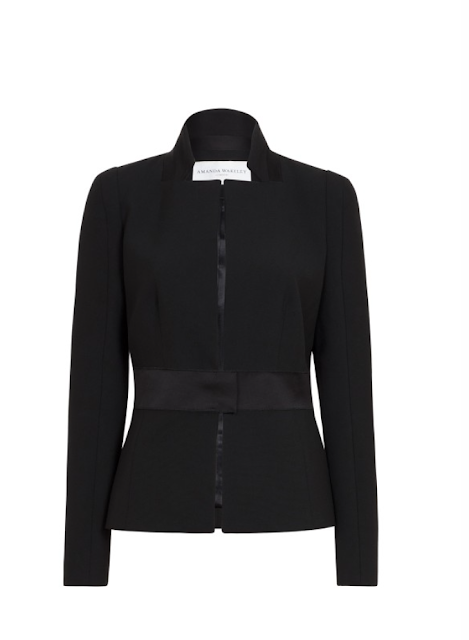 Here's my top pieces from Amanda Wakeley's new arrivals. Question is, will the PM be wearing this in the coming months? From welcoming President Macron to the UK and to some fabulous new clothes debuts, here's a recap of Theresa May's week! Headed back to Downing Street after the weekend, the PM was snapped in her new Herno coat, black trousers and the Charlize loafers from Russell & Bromley. 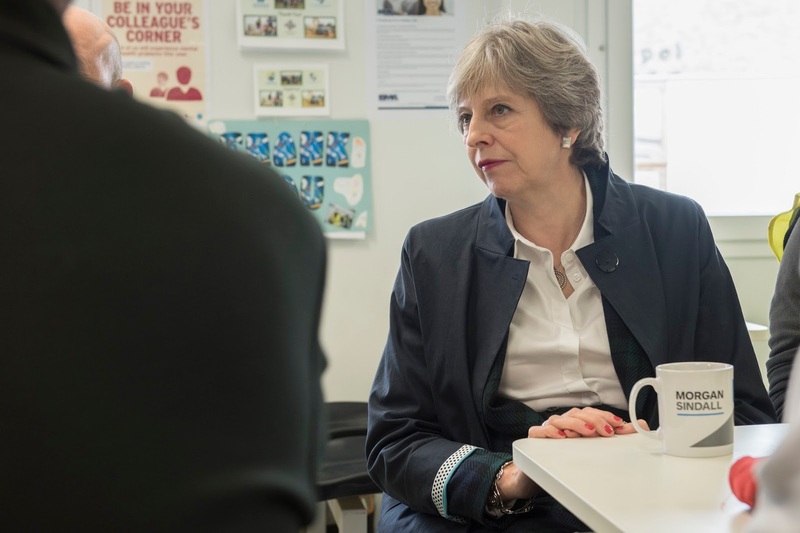 On Wednesday, the PM headed to the weekly Prime Minister's Questions in the House. 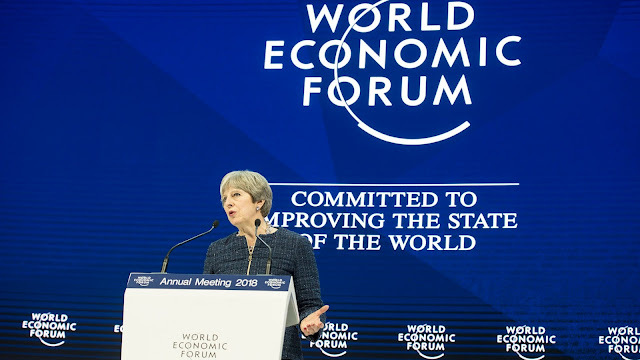 More exciting than the questions was Theresa May's new jacket! A Daniel Blake Origami number, the bold purple colour makes for an eye-catching piece. May teamed it with black trousers, and on trend colour clashed with the red Link In block heels from Russell & Bromley. She carried her trusty Vere satchel from Anya Hindmarch and kept warm in her fantastic Herno coat. 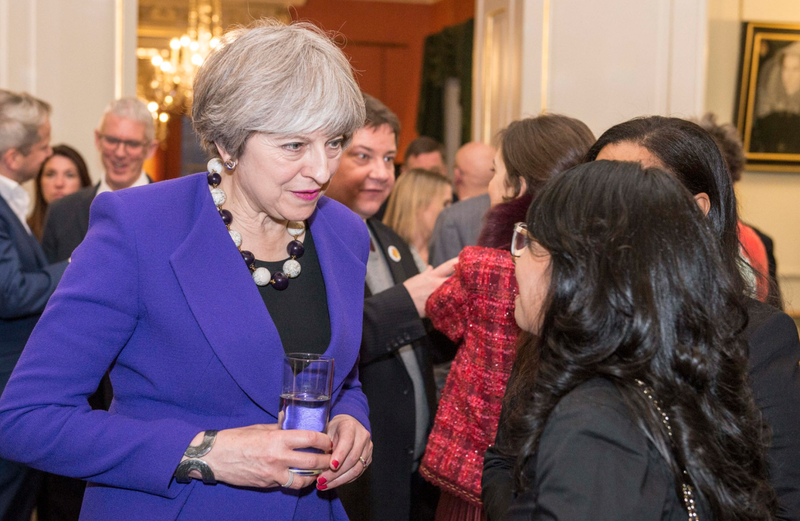 Later in the day, the PM hosted a reception for the Jo Cox Foundation at Number 10, marking its important, cross-party work tackling loneliness. 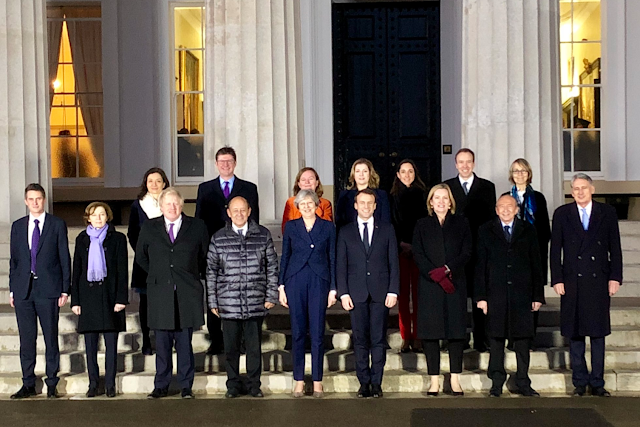 On Thursday, Theresa May welcomed President Macron of France to the UK on his first official visit. May and Macron dined at The Royal Oak Paley Street in Maidenhead, before heading to Sandhurst for a military parade and press conference. Later in the evening, the pair attended a reception at the Victoria and Albert Museum. 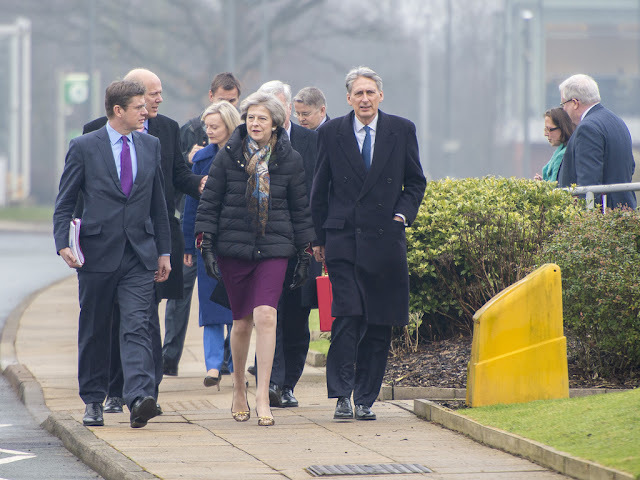 For this important day, May wore her navy spotted Daniel Blake trousers, navy trousers and the Kitty Charlotte Olympia heels. She braved the chill with her Herno coat. 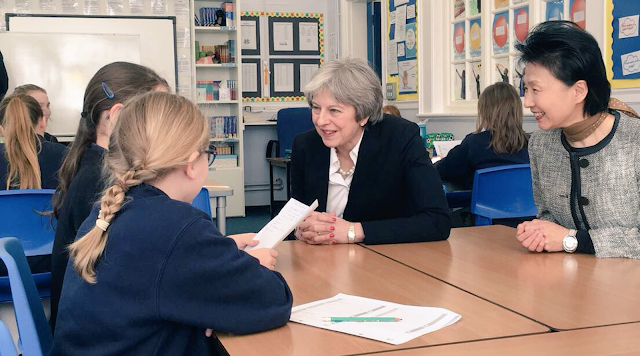 On Friday, the PM visited pupils at Waltham St Lawrence Primary School in her constituency. The first week of Parliamentary business after the Christmas break was not a quiet one for the Prime Minister! 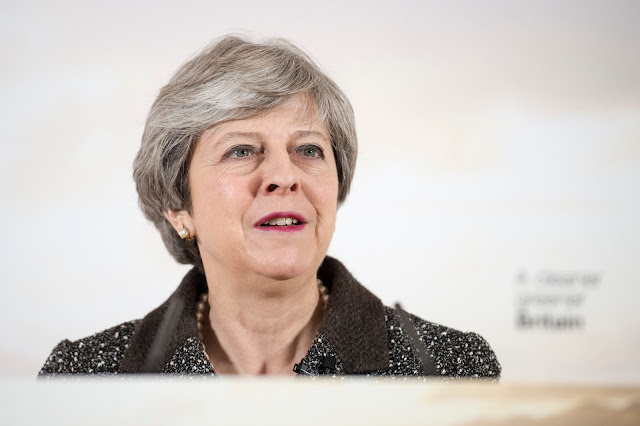 On Monday, Theresa May began her Cabinet reshuffle, with changes at the top table and across the board of Ministerial ranks. Fantastically, lots of women received promotions and new appointments, from sitting in the Cabinet to the Whips office. 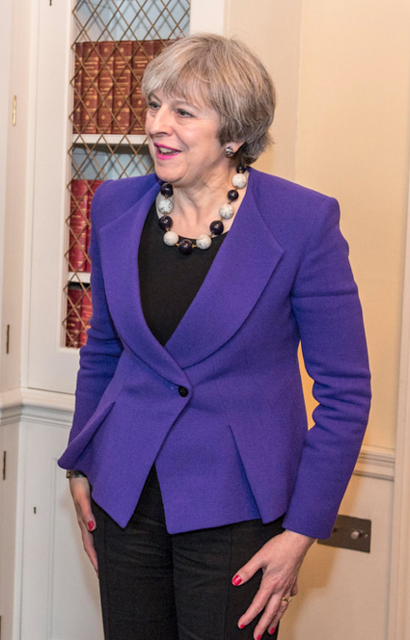 On the first day of the reshuffle the PM wore her purple jersey Escada dress, pairing it with a pair of vintage red and leopard kitten heels from Russell & Bromley and her Celtic Treasure ring. Keeping warm when arriving at Downing Street, May wore her new Herno wool and padded jacket. 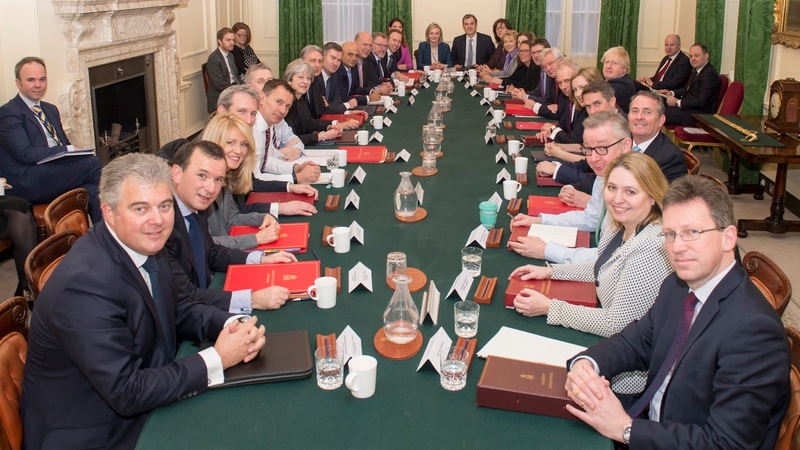 Tuesday brought day two of the reshuffle and the first meeting of the newly appointed Cabinet. 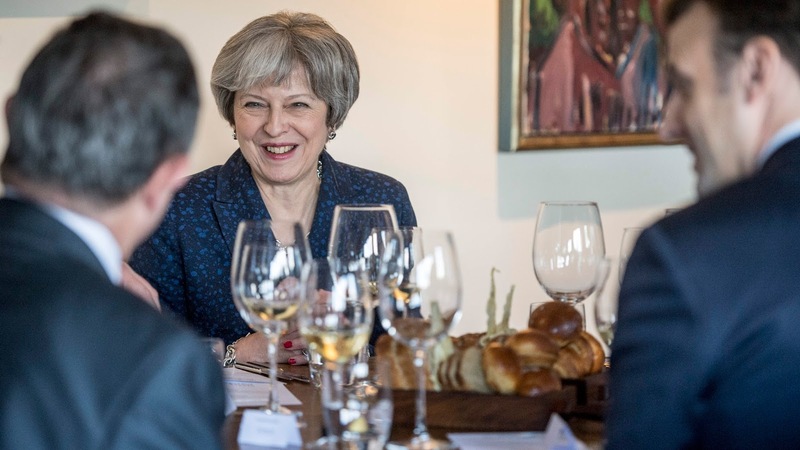 The PM wore a textured black jacket and skirt, accessorising with the Amanda Wakeley oversized chain necklace and bracelet. 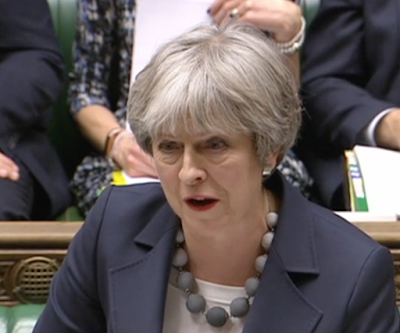 On Wednesday, Theresa May took part in the first PMQs of 2018. It was back to business in her familiar navy Escada skirt suit and the Kitty leopard heels from Charlotte Olympia. May accessorised with the grey fabric bead necklace and bracelet, her Herno coat and the Vere satchel from Anya Hindmarch. 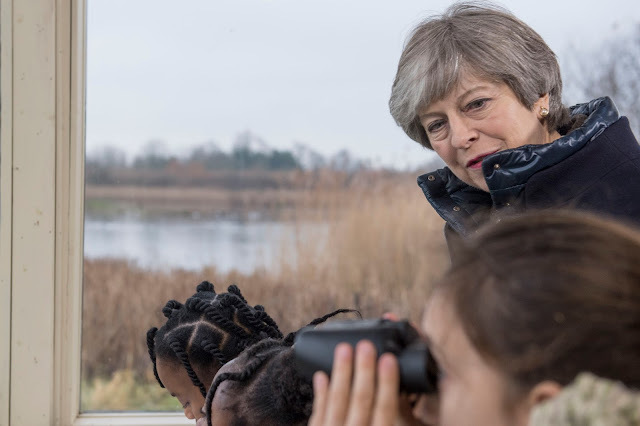 On Thursday, the PM launched her 25 year plan for a cleaner, greener Britain. May wore a brown textured jacket with black trousers and the patent sparkly brogues from Russell & Bromley. A simple strand of pearls and her Herno coat completed this look. Getting back to work in the Parliamentary recess, Theresa May highlighted the Government's work on housing and additional investment in the NHS this week. On Wednesday, the Prime Minister visited Laura, a first time house buyer in Wokingham to talk about and highlight the success of the Help to Buy scheme and the stamp duty exemption. 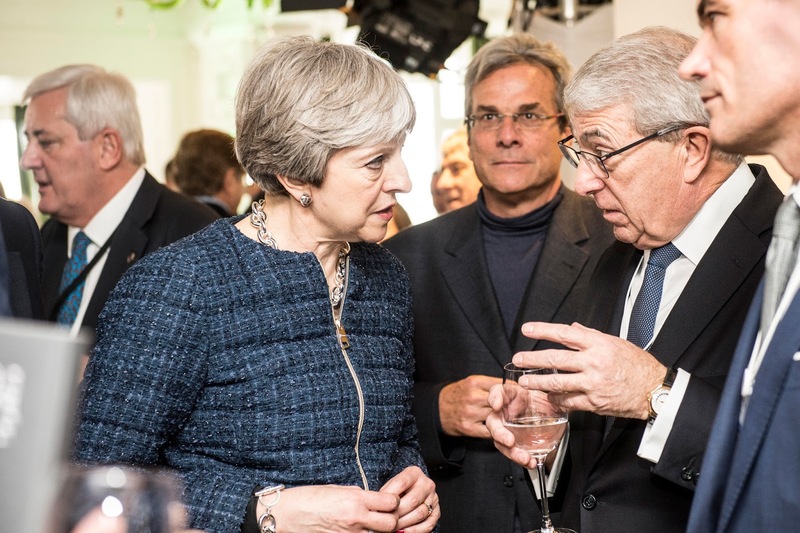 May wore an amazing new Herno padded coat- quite likely a Christmas present! 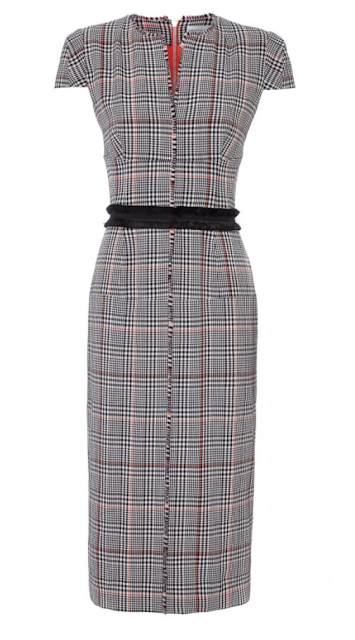 She teamed it with the brown Paule Ka blazer, trousers and the Charlize loafers from Russell & Bromley. 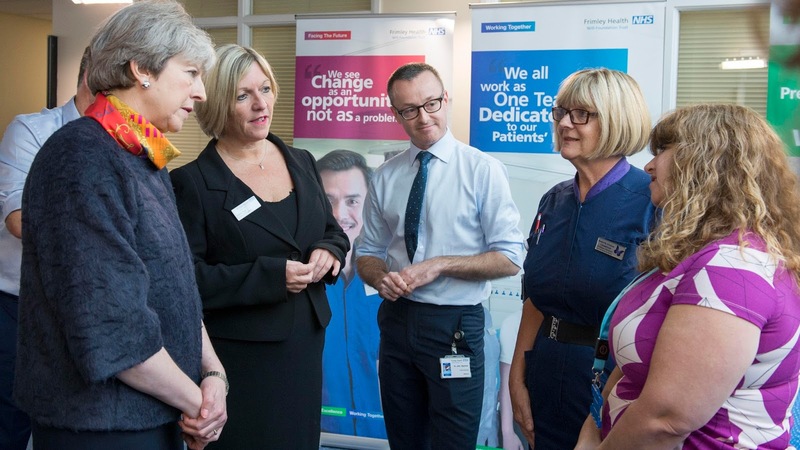 On Thursday, Theresa May visited Frimley Hospital, highlighting the additional investment in the NHS to tackle winter pressures. May wore a faux fur black jacket, skirt and the leopard Link In block heels from Russell & Bromley. What was super striking about this outfit was her Hermes scarf (the Vue du Carosse La Galere La Reale design) and how the PM tied it into a round neck collar. If anyone knows how to tie a scarf this chicly then please let us know! 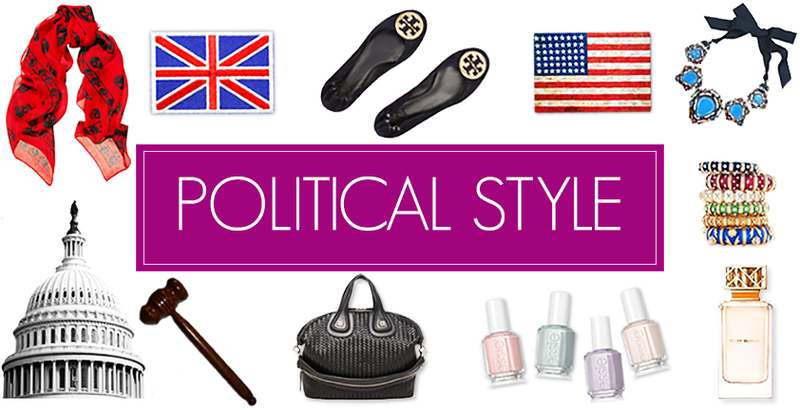 Snag a Theresa May Sale Bargain! 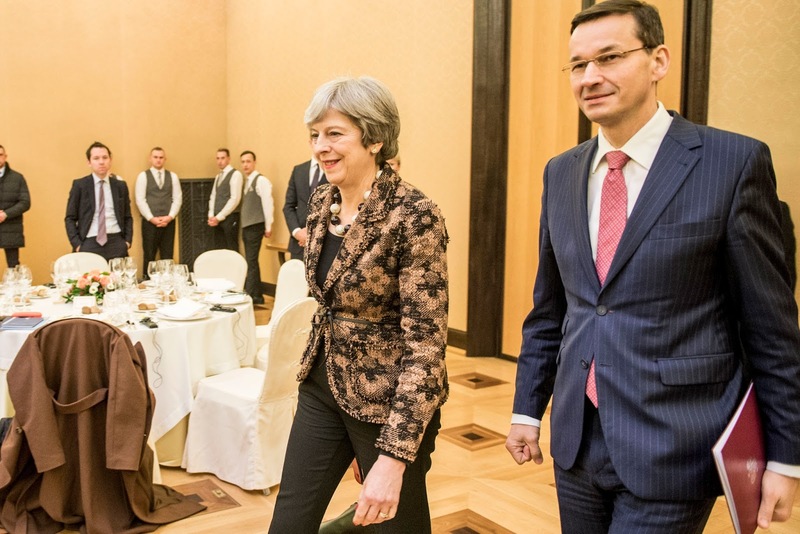 Theresa May has a fashion forward wardrobe, with many pieces that quite a few of us wish we owned! From jackets to shoes, here's a round-up of some of her purchases that you can snag for a fraction of the price.